Play EA SPORTS FIFA 13 Football Club in the Head to Head Lobby in the Xbox World Championship to position yourself at the top of VirginGaming.com‘s Leaderboard for your geographical region and you could win a trip for 2 to Wembley Stadium to see the Champions of Europe crowned on the 25th May 2013! 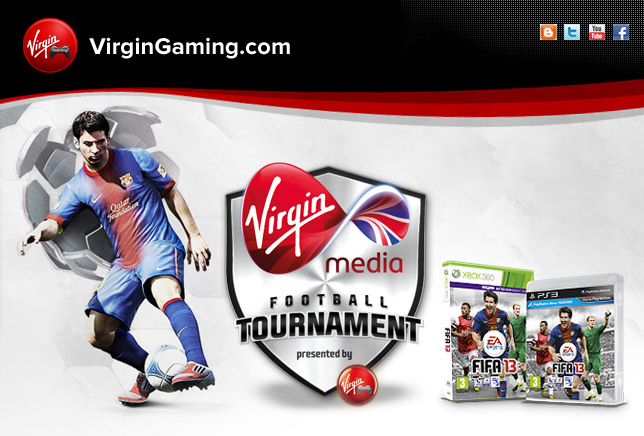 Sign up for VirginGaming.com and click on the EA SPORTS™ Football Club Xbox World Championship banner (please sign up using this link to support Sweetpatch TV). Click on the EA SPORTS™ Football Club Xbox World Championship Head To Head Lobby. Challenge anyone in the lobby to play in order to position yourself at the top of either the Most Wins Leaderboard (for those with the most wins playing EA SPORTS™ Football Club) OR the Highest Participation Leaderboard (for those with the highest amount of games played) for your geographical region. The top 20 people who place on the leaderboard for the most wins and the top 12 people who place on the leaderboard for the highest participation will move on to the Group Stages. For the Online Qualifiers you can challenge any player you want and play by your own schedule – game at whatever time works best for you. Games played will count on the leaderboard until January 7th, 2013. The top 32 competitors on the leaderboards from each of the eight (8) regions will advance to the Group Stage (top 20 players with the highest amount of wins, and the top 12 players with the highest participation). These 256 semi-finalists will compete in thirty-two (32) eight-man Group Stages on January 19, 20, 26 and 27th 2013, where they will play against each other for a seat in the single elimination Group Stages. The matches in the Group Stage will be set up automatically and cannot be changed. Match times and details will be announced after all qualifiers have been played. The winner of each of the thirty-two (32) eight-man tournaments will be placed into a thirty-two (32) man Bracketed Final which will take place on February 3, 2013. Match times and details will be announced upon completion of the semi-final round. Online Bracket Finals will be set up automatically and cannot be changed. The grand prize winner will be announced on February 5th, 2013. The grand prize winner will receive a trip for two to Wembley Stadium to see the Champions of Europe Crowned! Remember, only one lucky winner will get THE TRIP AND TICKETS and 32 other players will get cash! So make sure you’re gaming all day, every day to secure your spot in the online semi-finals. 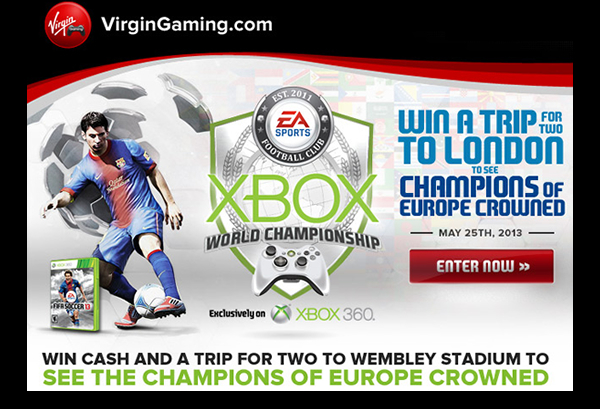 Sign up for VirginGaming.com and represent your country in the EA SPORTS™ Football Club Head to Head Lobby to get onto the Xbox World Championship Leaderboards and your shot at the trip to Wembley Stadium.